O.K. this garden is not in NY which we usually write about but is less than 2 hours from Manhattan, a beautiful ride up the Hudson to Washington CT, Litchfield County. George Schoellkoph's Hollister House is an eighteenth century historic home with newer additions. 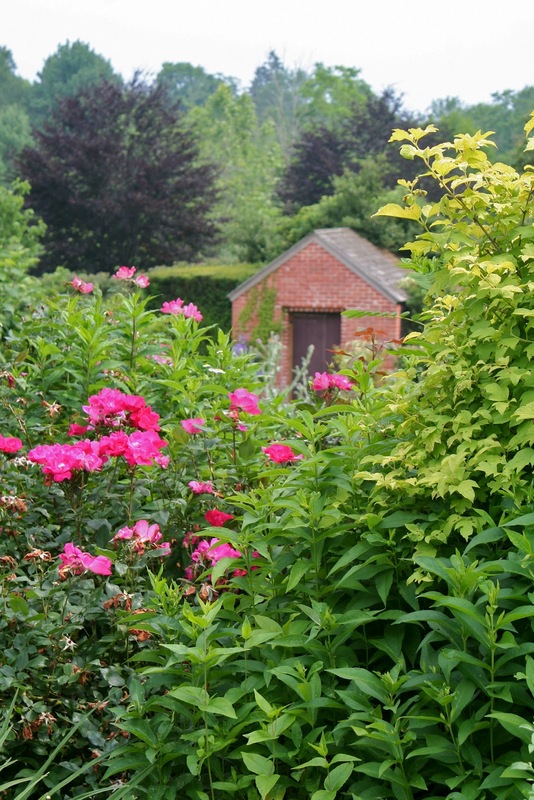 It's available for all to see on the Garden Conservancy Open Days. Hollister House Garden is based on the English ideal of paths and rooms, places to meander among shrubs, perennials, self-sewn annuals, even some patches of vegetables. I visited on a brutally hot day last week. The bench above would have been perfect to sit with a tall iced tea and enjoy the scent of Nepeta with a book in hand. But paths and arches led elsewhere, and the design forced me to explore the many rooms and admire the foliage color and texture. All seemed to be combined effortlessly, but every gardener knows how much effort that really takes. The eye and brain of an artist planned this garden, yet the feeling is casual, not egotistical, not demanding credit. 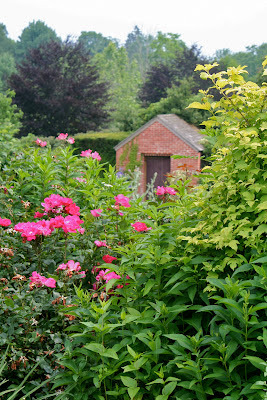 Containers are strewn everywhere, bordering paths and in the garden itself. By the pond is another seat that I must by-pass and move to where the bench color is the perfect foil for the flowers or is it the other way around?The property undulates offering glimpses of gardens above and below. Hollister House Garden is easy to visit on the Garden Conservancy Open Days program . (See information in our BYTE NOW column, top left of this blog). 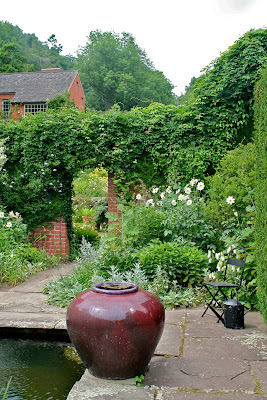 In addition Hollister House Garden is hosting a special Garden Study Weekend Aug. 24-26, 2012. Schoellkopf has signed an irrevocable agreement with the Conservancy for donation of house, out- buildings and garden, either during his lifetime or by will, along with not less than 2 million dollars in trust for maintenance in perpetuity. 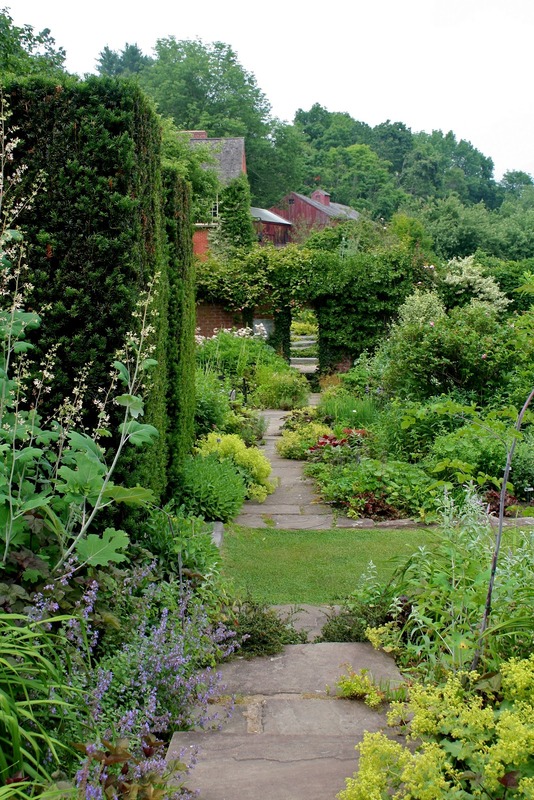 All gardeners can be grateful to him for his generosity and foresight. If you don't fall in love with this garden as I did, the yellow mulleins by the river at the bottom of the garden express my thoughts. Love this garden post. Thank you. It looks so cool and inviting. The dreamy look belies the relentless, scorching heat that has choked us - and the plants - all week in the East. (What a way to user in summer!) Thanks for braving the elements to bring us this beauty. A truly beautiful garden! Thank you for sharing your visit! !